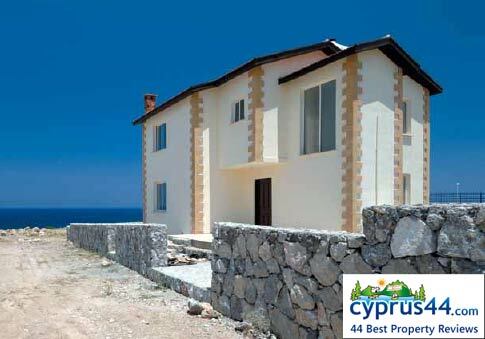 Esentepe Seafront Villas is one of the best properties listed in Cyprus44 property reviews. We have received news that this company is in default on many contracts and is failing to communicate with many customers who now face losing their deposits. Esentepe Seafront by Blossom Properties Ltd is an exclusive development of just twelve villas, all with sea views, and as close to the sea as you can get in North Cyprus, just 50 metres from the coastline! Blossom Properties have specialised in building luxury villas and apartments in North Cyprus for over 25 years, far longer than most TRNC construction firms have been in business. With agents in both the UK and Cyprus, Blossom Properties offer 24-hour service for their customers. Their proven track record of successful, quality developments also include sites in the USA and Germany. The Esentepe Seafront development is built right on the seafront in this sought-after North Cyprus property hotspot, and every villa not only has guaranteed, Government-protected uninterrupted sea views, but quick and easy access to the beach too. Esentepe is best known for its excellent new golf course, but many property investors don't want to sacrifice sea views or proximity to the beach just to be closer to the golf course. At Esentepe Seafront you have the best of both worlds; the sparkling Mediterranean Sea on your doorstep, and world-class golf just a five minute drive away! What's more, you don't have to wait years to move in, as Blossom Properties aim to have all villas completed by December 2008. The twelve villas offer floor areas from 160sqm to a generous 195sqm, within a plot of up to 1202sqm, each with a large balcony overlooking the sea shaded by a gazebo. An elegant curved ground floor bay window makes the most of the views from the lounge area, and provides a sunny terrace area above, accessed from the second floor hallway, not via a bedroom. The two storey villas have spacious open-plan kitchens, and three bathrooms, including a separate toilet under the stair and an indoor storage room, always useful when relatives come to stay! 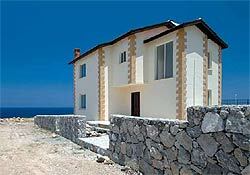 Each villa has plenty of parking, and their gardens are enclosed with natural stone walls. Optional extras include an en-suite bathroom for the master bedroom, a private swimming pool up to 5m x 10m, security system, air conditioning and heating, and CCTV. At time of writing, only five villas remain for sale, three Deluxe (195sqm) and two Big (160sqm), with prices starting from £104,950. Although only five of the villas at Esentepe Seafront face directly onto the sea, those a little further back have been carefully angled to allow those all-important sea views. At present, the site is rather bare and exposed, as landscape planting has not yet established. 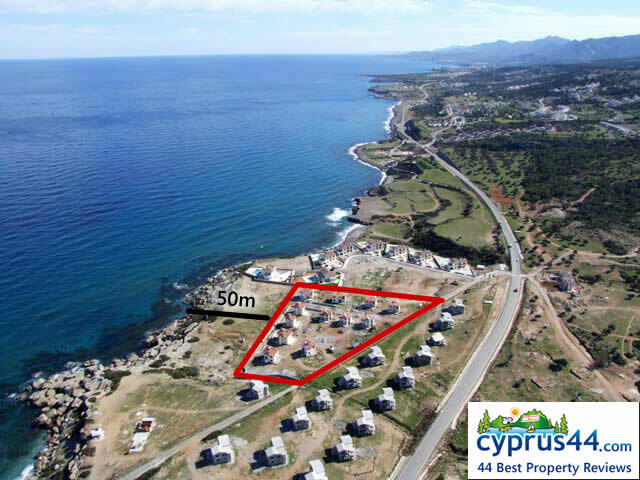 From the outside, the villas are not the most exciting design available in North Cyprus, nor are they the cheapest, but at Esentepe Seafront it's all about location, location, location. 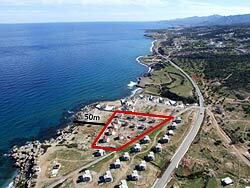 And at just 50 metres from the sea, North Cyprus sea views and beach access don't get better than this! A dream to wake up with the sound of sea waves is not far away! This web page is served on 19 April 2019 at 23:34:10.